Completism is a disease. I had one of the most enjoyable rides of my life on Pheasant Road a few weeks ago, but then I looked at the maps and saw that there were a couple of trails I missed. So I decided to complete the set. It was raining last weekend. Not heavily, but an all-day rain. That could have been a problem; I have a rule against causing any damage (particularly when I'm already breaking other rules), so if the trails were muddy I'd have to turn back. My web searching had uncovered a description of a guided hike into this area a few years before. That hike started at the gate SA04, rather than heading up Pheasant Road. So the first challenge was to find that trail. On the satellite image, it looked like it probably met up with Pheasant Road at its eastern-most turn, where I didn't even remember a trail. This part of the story actually begins the previous day, on my Reynolds Road ride. On the way back, I decided to hop over SA04 and explore. The first thing one finds is a cleared area, possibly a future parking lot, with one vehicle parked there: a front-loader. That same front-loader actually shows up in the satellite images, oddly enough. It's been there for years? The trail wanders by the cleared area and climbs the hill behind it. At the top of the hill, you reach a fork. This first day, I took the high road, the right fork. That's the wrong fork. It heads up through a set of indifferent paths that aren't really ridable and don't give you the impression of getting anywhere. Plus, I was tired from the earlier part of the ride. So I turned around. The next day, in the rain, I took the left fork. That trail descends to cross the bottom of a ravine, turns north, climbs a little, and reaches a sharp U-turn (shown in the picture here). At this stage you're quite close to Hicks Road again. I was feeling pretty good because I was exploring a new trail and nicely isolated and it was only drizzling. I mention that because that good feeling was coming to an abrupt end. From this point, the trail heads upward for a half mile at a roughly 20% grade (according to Garmin). The trail is good, a former four-wheel track of which only one side is generally clear now. It is soft with leaves and growth, and I just wasn't up to it. Although I tried pedaling in a few different places, I ended up pushing my bike pretty much all the way up to Pheasant Road. I hate pushing my bike. It's much more tiring than walking or even riding, but I just couldn't manage the grade. Generally there was just one semi-clear path, so I had the choice of walking through weeds with my bike on the clear path, or walking on the path and pushing my bike through weeds. I got to Pheasant Road in a dark mood, thinking seriously about turning around. The top of the trail flattens out a bit, and once I was back on my bike my mood lightened almost immediately. I really enjoy riding a bike. The trail intersects with Reynolds Road at the road's steepest point, but it's not as steep as the trail was, and it's at least ridable. My goal at this point was a little tail of a trail at the southern end of the circle route I had taken the previous week. I had seen the intersection, and it showed up on MROSD maps. Part of the way there, I was resting my heart when I realized that I was hearing a very rhythmic sound from the woods. It could have been someone or something walking through brush, but the sound seemed distant and therefore would have had to be loud. And nothing's quite that regular, walking through brush. I couldn't think of a natural process that would produce such a regular rhythm, and I never did figure out what it was. But it unnerved me a little, and gave me the impression that I might not be alone. When I got to the footpath off the main trail, I decided it needed some exploring too. I left my bike on the trail and walked up the steep path, which then turned north and... just kept going for a little while. Still somewhat unnerved, I was uncomfortable leaving my bike for too long, and I turned around before I figured out where that path went. Based on maps and other hints, it looks like it probably heads up toward a rock formation, but I guess I'll need another trip to confirm. Completism. It was raining lightly but constantly. Back here the tree cover is thick and the trail was dry. After reaching the top of the trail at 1600 feet (partly walking the damned bike again) and then heading back down a bit, I got to the intersection with that little spur trail. 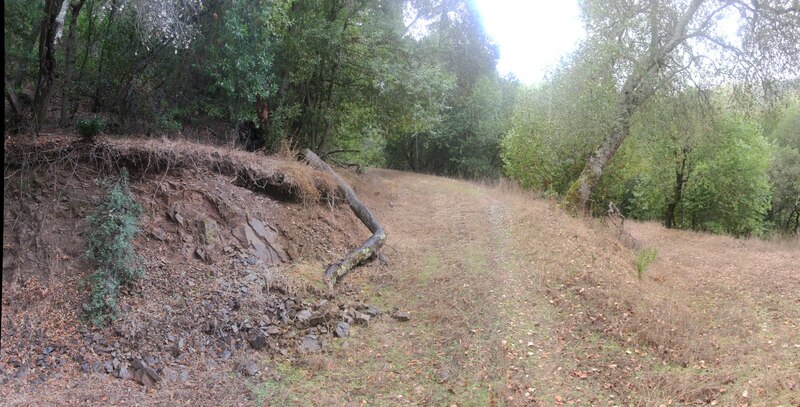 This trail is short (only about 1/8 mile) but steep (it gains ~130 feet). Like the others it was soft, reasonably clear but only partly ridable by me. All trails go somewhere, right? Particularly this sort of spur trail? In this case, it leads to a clear, flat area that's pretty distinctive on a terrain map. It's a very pretty little area, surrounded by trees. Red leaves cover the ground, and the fallen trees have bright green moss growing on them. A little creek flows through here. This might be Hicks Creek, but it had been raining all day, and it might just have been some random unnamed runoff. So what does this trail lead to? Was it just leading to this bucolic area, which might be a nice camping area if you're into that? Maybe, but just beyond the end of the trail was a chain link fence, incongruous in this patch of nature. There wasn't anything visible inside the fence, and I wasn't sufficiently intrigued to collect even more poison oak to investigate. Nothing obvious on the satellite image, incidentally. Update: a little searching indicates that Cherry Springs (the actual spring, not the pond) is right here. I'm assuming it's in the fenced-in area. So it's back down the trail, around the east side of the hill to complete the circle. Arriving back at Cherry Springs Pond, I looked around for the last bit of unfinished business. The MROSD map shows a trail that runs from the pond area to somewhere near the gate on Pheasant Road, but to the southwest of Pheasant Road itself. That means it probably runs on the other side of the hill that Pheasant Road climbs. In my earlier exploration, I hadn't seen any sign of such a road. I rode around all the visible trails, but couldn't find this missing one. Eventually I decided that it just had to be on the other side of one particular ridge, and started trying to find a way through. Once I found an area clear enough to cross, it became obvious that I was indeed already on the trail, disguised by layers of leaves. Or on a trail, anyway. This new trail headed northwest, and was generally a level ridge trail. But the valley falls away, so after a while you have a steep drop to the left, and basically cliffs to the right. In the middle you have a trail that has seen neither traffic nor maintenance in years. The picture here shows the trail near its southern end, and it just gets worse and worse from here. I'm not complaining, mind you; no one invited me here. I'm just describing. Worse means generally thinner, with a single clear track that sometimes meets the edge of the cliff. I was walking my bike in one section when the entire width of the clear track came within a foot of the edge, which was disguised by grass. If you were riding in that area, the margin for error would be tiny, and the consequences severe. In at least one place a rock slide has completely blocked the trail; I climbed over, stupidly, carrying my bike. I dislodged a rock that just fell and fell, forever. Having crossed the rock slide, I couldn't turn back without crossing it again, and I definitely didn't want to do that. I figured that if I had to do it, I'd start by abandoning the bike. Along the way one sees lots of rocky sections above the trail made of the same sedimentary stone that fell across the trail. And it was raining. But no further rock slides today. The next obstacle was a tree that had fallen over the trail, then kept growing. For a minute I thought I was going to have to crawl on my belly like a reptile, but I found a section I could wrestle my bike and myself through, with only minor scratches. The tree, along with the general overgrowth of the trail, shows that this trail hasn't been clear in many years. The housing development near Cherry Springs Pond dates back to before 1993; this trail may have last been clear back then. The last part of the trail was the worst. It's flat and clear, but goes very near the caretaker's residence. I may have imagined it, but I thought I could hear voices. So that violates my rules -- I don't get that close to people's homes. It's creepy, and for all of these reasons I'll never ride that trail again, and encourage others to avoid it. The trail exits directly into the gate across Pheasant Road, so I skirted it (acquiring even more poison oak in the process, I think) and rode home. Again, a short ride of about 12 miles and 1800 feet of climbing. Some fun exploring, but too much pushing the bike, too much risk, and too much interference for my taste.